11/1/2017 - Leigh-on-Sea to Limehouse. Charing Cross to London Bridge. London Bridge to Tulse Hill. Tulse Hill to St Pancras. Fenchurch Street to Leigh-on-Sea. My first railway outing of 2017 was just a short jaunt into London to visit some of the London terminal stations for a new book I am writing, which should be out later this year. 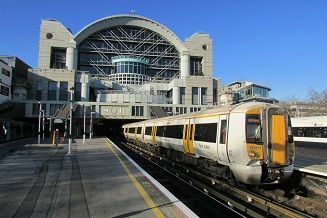 One station I visited was London Bridge which is nearly finished in its complete rebuild. Although it is all very modern, I personally don't like the way you go into the front of the station, then have to go downstairs to the new concourse (where there aren't any waste bins by the way), then have to go back up to the platforms to catch a train. Plus they have destroyed the old passageway with all the shops that you used to walk through on the way to the terminal platforms, which is a great pity. 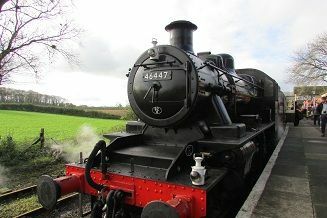 Alton to Alresford and return on the Watercress Line. A quiet month by my standards, mainly because I have been suffering from a heavy cold and had to postpone going on a railway trip on 11th February because of it. I did get away with my wife for a few days towards the middle of the month and stayed over the weekend in Aldershot. 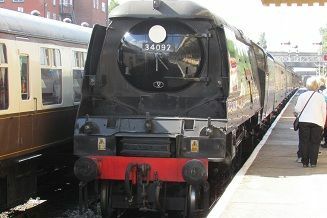 Whilst there we went over to Alton to have a trip on the Watercress Line. Rather than driving there from Aldershot, we decided to take a train from Aldershot to Alton and then hop over the platform to the Watercress Line platform. It was the first full weekend of operating this year and was quite busy, though I didn't see many children which you might expect, it being half term. Coming back the train was delayed, so as we arrived at Alton, our South West Train back to Aldershot was just leaving as we came in. What a pity they didn't hold the train for the twenty or so passngers that had to wait another half hour for the next train back to Aldershot and London! Went to London to see Procul Harum in concert. Went to London to see Gilbert O'Sullivan in concert. 24/3/2017 - Leigh-on-Sea to London Fenchurch Street. London Paddington to Penzance via Bristol. Penzance to Plymouth. Went down to Plymouth on business. I managed to fit in a fleeting visit all the way down the Cornish Mainline to Penzance. My original timings gave me approximately fifty minutes in Penzance, but due to a freight train derailment near Castle Cary on the Monday all trains going to Taunton and beyond were being diverted via Bristol. So by the time we git to Penzance we were about forty minutes late, giving me around ten minutes there! Just enough time to take some photos of the station, both inside and out. 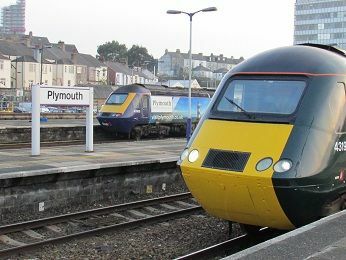 I then went back to Plymouth on the same HST I had come on, this time 1st class, for just £10. I was treated like royalty and had no end of teas, bottles of water, biscuits and cakes! Plus much nicer seats with a quieter and less crowded carriage than on the way down. 25/3/2017 - Plymouth to Saltash and return. 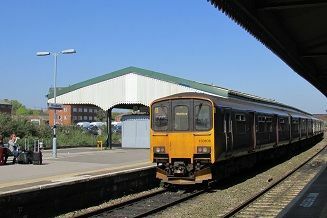 Plymouth to Exeter St Davids. Exeter St Davids to Basingstoke. Basingstoke to Reading. Reading to London Paddington. London Fenchurch Street to Leigh-on-Sea. In the morning before I returned home I took a quick trip back over Brunel's Royal Albert Bridge into Cornwall to Saltash. I had enough time to take some photos and have a full "Cornish" breakfast in a small cafe before returning to Plymouth. I then caught a train to Exeter St Davids, before changing to a South West Train to go back to Waterloo via Yeovil. However, when checking the train times on the board at Exeter it said at Basingstoke it would be bus to Woking due to engineering works. When I booked my tickets with The Train Line, this did not show up, so I decided to go to Reading and catch a train to paddington which I did, saving at least half an hour in delay time. 8/4/2017 - Leigh-on-Sea to London Fenchurch Street and return. London Waterloo to Weymouth. Weymouth to Westbury via Frome. 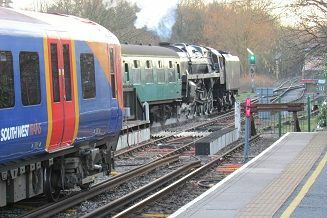 Westbury to Southampton via Salisbury. Southampton to London Waterloo. Went down to Weymouth for the day courtesy of South West Trains doing a special offer of a single journey anywhere on their network of for just £14. On the way at Southampton I saw all these people with cameras and then we pulled in next to a steam railtour, "The Royal Wessex" being hauled by Light Pacific no 34046 Braunton as 34052 Lord Dowding. It was waiting for our train at Southampton and then followed us all the way down to Weymouth where there was a large crowd waiting. After a short time in Weymouth I went north and east to Castle Cary and then Westbury, before going back down to Salisbury, where there was another staem engine waiting. This time it was "The Moonraker" special from Solihull to Salisbury being hauled by Castle Class no 5043 Earl of Mount Edgcumbe. I then completed my circular rail tour by going back south to Southampton, and then back to London for another £14. 10/4/2017 - Leigh-on-Sea to London Fenchurch Street and return. Went up London to see the show, "Carousel" at the London Collesium. Went up to London for a meeting. 13/5/2017 - Leigh-on-Sea to Barking. Barking to West Ham. 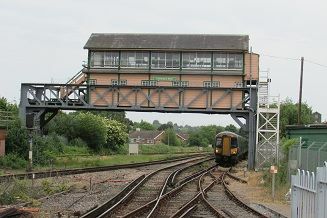 London Bridge to Norwood Junction. Norwood Junction to West Croydon. West Croydon to Sutton. Sutton to Horsham. Horsham to East Croydon. East Croydon to London Bridge. West Ham to Leigh-on-Sea. Went down to Horsham for the afternoon after going on some South London lines I hadn't been on for a while. 20/5/2017 - Leigh-on-Sea to West Ham. Canada Water to Crystal Palace. Crystal Palace to Balham. Balham to Streatham Common. Streatham Common to Battersea Park. Queenstown Road Battersea to Vauxhall. Vauxhall to London Waterloo. London Fenchurch Street to Leigh-on-Sea. Another afternoon of travelling over some South London lines I hadn't been on for a while, before going to the Royal Albert Hall to Roger Hodgson in concert. 29/5/2017 - Gravesend to Ashford International via Margate and Dover. Ashford International to Ramsgatevia Canterbury West. Ramsgate to Canterbury West. Canterbury West to Ashford International. Ashford International to Stratford International. Stratford International to Gravesend. After dropping my family off at Ebbsfleet International to catch the Eurostar to Disneyland Paris - not Eurodisney as the info sign at Ebbsfleet mistakenly states - I drove to Gravesend. I then went on a Kent Rover ticket all round the coast of Kent, spent some time in Canterbury and then went to Stratford International before going back to Gravesend. 31/5/2017 - Leigh-on-Sea to Fenchurch Street. London Bridge to Tonbridge. Tonbridge to Ashford International and return. Tonbridge to St Leonards Warrior Square. St Leonards Warrior Square to Ore. Ore to Brighton. Brighton to East Croydon. East Croydon to London Bridge. West Ham to Leigh-on-Sea. Using my Kent Rover once more I went down to Tonbridge and across to Ashford International, before going down to Hastings and along the Coastway East line to Brighton and then back up to London. 2/6/2017 - Gravesend to Dartford. Dartford to Hither Green. Hither Green to Cannon Street. Cannon Street to Dartford via Deptford. Dartford to Gravesend. Went into London from Gravesend before going to Ebbsfleet International to pick up my family returning form Disneyland Paris. I went into London via Sidcup and came back via Charlton. I had a good look at the work going on at London Bridge and from what I saw there is still a long way to go! 24/6/2017 - Denham to Wembley Stadium and return. Went to Wembley Stadium to see Jeff Lynne's ELO in concert. Decided to drive round the M25 to catch a train in from Denham. The only problem was that there was a major accident on the M25 which meant we were held up for nearly an hour and missed the train we were hoping to get. In the end we had to wait for nearly half an hour for the next one, so we arrived at Wembley just as they were coming on stage. After the show it was "interesting" to see how the crowds returning north were shepherded. It was fine for passengers going back to Marylebone as they just went straight onto the platform, but passengers going north were put into three differnt queues - Birmingham, Oxford and High Wycombe. I wnet into the Birmingham queue, not knowing whether Denham counted for this one or High Wycombe. We were allowed onto the platform about five minutes beofre the train was due in, to stop overcrowding on the platform. Luckily we were in the correct queue and we caught the train we were meant to, though it was very full until Denham where at least forty passengers got off, just ten minutes later. 30/6/2017 - Leigh-on-Sea to London Fenchurch Street. London Kings Cross to Doncaster. Doncaster to Hull via Selby. Hull to Selby. Selby to Leeds. Leeds to Goole via Knottingly. Goole to Hull. Had to go up to Hull on business. I was tempted to go the whole way on Hull Trains but it was so exepensive that I caught a Virgin East Coast train first and changed at Doncaster onto a Hull Trains there. It was interesting going up the old East Coast main line to Selby and then east to Hull rather than the direct way via Goole. At Hull Paragon station there were plenty of banners for Hull being the 2017 City of Culture, plus an interesting statue of Philip Larken on the platform. Also Hull station doesn't have any ticket barriers unlike Leeds. I went back west to Leeds where I caught the rare train to Goole via Knottingley. It was very full - in fact over full in my opinion as far as Knottingley, then there were just a handful of us left to Goole - "track bashers" as one of my felllow passenegrs put it. By the way there was a guard on board but he didn't check our tickets once! 1/7/2017 - Hull to Doncaster via Goole. Doncaster to Barnetby via Scunthorpe. Barnetby to Sheffield via Gainsborough Central. Sheffield to London St Pancras. Limehouse to Leigh-on-Sea. Returning home from Hull, I made a detour to catch the saturdays only service that goes via Gainsborough Central from Cleethrorpes to Sheffield. It was pretty empty when I got on at Barnetby and I don't think more than a handful got on at the stations of Brigg, Kirton Lindsey and Gainsborough Central. However at Retford, Worksop and all the stations into Sheffield there were plenty of passengers, so much so that the train was full by the time it got to Sheffield. Nothing of interest on the journey back south from Sheffield, apart from at Chesterfield where 60103 Flying Scotsman was waiting on the northbound platform with an excursion! A word on train fares. A single from Hull to Doncaster with Northern (on a saturday - so off peak) cost me just £8.50. Yet a single from Doncaster to Barnetby with Trans Pennine - a comparable distance (also off peak on a saturday) - cost me a whopping £17.60, over double the Northern fare. The words "rip off" come to mind here. 8/7/2017 - Leigh-on-Sea to West Ham. Lewisham to Barnehurst and return. Lewisham to Peckham Rye. Peckham Rye to Streatham Common. Streatham Common to Tulse Hill. Tulse Hill to London Blackfriars. London Fenchurch Street to Leigh-on-Sea. A quick jaunt round some of the remaining lines in South London that I needed to cover. Despite industrial action going on at Southern my trains to and from Streatham Common ran on time. At Blackfriars I wasn't able to get on the underground due to a fire, so had to walk along the embankmant to Mansion House where I caught my tube to Tower Hill OK.
23/7/2017 - Benfleet to London Liverpool Street. Moorgate to Finsbury Park. Highbury & Islington to Hackney Central. Hackney Downs to Cheshunt. Cheshunt to Stratford. West Ham to Benfleet via Ockendon. Went up to London for the evening to visit some lines I hadn't been on for some years. 25/7/2017 - Leigh-on-Sea to London Fenchurch Street. 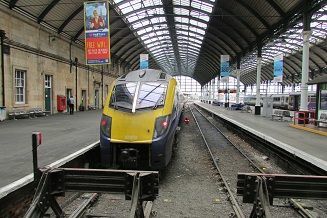 London Kings Cross to Berwick-upon-Tweed. Berwick-upon-Tweed to Haymarket. 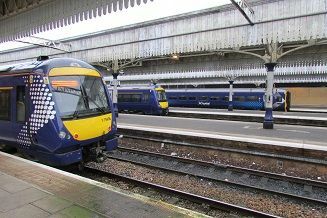 Haymarket to Edinburgh Waverley and return. Edinburgh Waverley to Tweedbank and return. Went up to London on a mini break partly to cover the reopened Waverley route and to cover some suburban lines in Glasgow. Stopped off on the way at Berwick-upon-Tweed to take some pictures of the bridges there. It's a nice station and town and travelling onto Edinburgh I was able to catch "The Highland Chieftan" train right through to Haymarket where my accommodation was. After checking into my room I made my way back to Haymarket and onto Edinburgh Waverley where I was able to get onto my Borders Railway service to Tweedbank about twenty minutes before departure. I was glad I did get on so early as it was packed with both tourists and commuters and when it did leave at 18.23 it was standing room only on the mere 2 car Class 158 unit. I had been down the line before a few years ago as far as Newcraighall so it was interesting to see the new line and all the stations that have been built. As it stops in the Edinburgh suburbs and satellite towns south of the capital it was nice to see plenty of commuters getting off, who now use this service rather than going into Edinburgh by car or bus. When we reached our final stop, mostly tourists were getting off to go into the large car park next to the station, obviously having spent the day in Edinburgh. It would be nice to see it extended all the way to Carlisle one day, but I can't see that ever happening due to cost and lack of big towns on the route. 26/7/2017 - Haymarket to Edinburgh Waverely. Edinburgh Waverley to Aberdeen. Aberdeen to Dundee. Dundee to Perth. Perth to Haymarket. Haymarket to Glasgow Queen Street. Qlasgow Queen Street Low Level to Charing Cross. Charing Cross to Kilpartick. Kilpartick to Dalmuir. Dalmuir to Rutherglen via Westerton. Rutherglen to Glasgow Central Low Level. Glasgow Queen Street Low Level to Charing Cross. Next morning I took the 08.28 from Edinburgh to Aberdeen. Rather than getting on the train at Haymarket I went into Edinburgh to get my the full value of my £10 fare for a first class ticket. If I had gone 2nd class it would have only been a fiver - thanks to the Scottish government's policy of subsidising their railways. English politicians take note! The only negative thing about the journey was that it bucketed down all the way so I wasn't able to get some of the pictures of the bridges I was hoping to get, but it did clear up for the return journey via Perth. I stopped off in both Perth and Dundee but prefererred Perth as a town. I then came back to Haymarket before joining the hordes of commuters going home to Glasgow, being met at Queen Street by the hordes of commuters going home to Edinburgh! I was lucky enough to get a seat in second class and observe the work being done in electrifying this line. After checking in at my hotel, I went west out to Kilpatrik and then back through the centre of Glasgow to Rutherglen, this time being surrounded by hordes of Celtic fans going to a match. 27/7/2017 - Glasgow Central to Carlisle via Kilmarnock. Carlisle to Leeds via Settle. Leeds to London Kings Cross. London Fenchurch Street to Leigh-on-Sea. The next morning I got the 08.37 from Glasgow Central to Carlisle via Kilmarnock which was quite a slow journey, but on one of the least used routes in Scotland. Yet it used to carry express trains from London over the old Midland Railway route. After a short break in Carlisle it was off to Leeds via the Settle & Carlisle. Again the train was pretty full, though this time there were four carriages. Again the weather was very wet and misty, so I couldn't enjoy the route as I had done the previous time I had travelled on this route. Finally, after another short break in Leeds, it was back to express train travelling with Virgin East Coast back to Kings Cross after a pretty hectic few days in Scotland. 16/8/2017 - Bury Bolton Street to Rawtenstall and return. Rather a quiet month for railway travel for me considering it was the height of summer. This year I went on holiday with my wife up to Lancashire and the Lake District. As it was almost ten years since I last visited the East Lancashire Railway when I drove a Deltic, I decided to go back to cover the line to the north of Bury which I hadn't travelled before. On the journey back we sat next to a locations manger for film companys who was filming the journey for possible use in a period drama set in early industrial Britain. 30/8/2017 - Upminster to West Ham and return. Canada Water to Clapham Junction. Clapham Junction to Imperial Wharf and return. Clapham Junction to Wandsworth Town. Wandsworth Town to Putney. Putney to London Waterloo. My only day actually spent travelling on Network rails was going up to London for the day. I spent a day in west London travelling around the area, visiting some of London's bridges for a new book I am writing to be published next year. 21/9/2017 - Leigh-on-Sea to London Fenchurch Street and return. 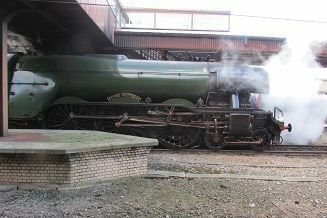 London Kings Cross to Barrow Hill Roundhouse and return via Grantham, Notingham and Chesterfield. Went on the Hertfordshire Railtours Trip to Barrow Hill called "The Grand Reopening" where our excursion would be given unique access to the site a day before it opened to the public. The attraction was to see Tornado (from the 21st centrury), The Flying Scotsman (from the 20th centrury) and Rocket (from the 19th century) all in steam with around three hours to spend there. Unfortunately, it was not as exciting as it sounded on paper. Firstly, Rocket couldn't make it for whatever reason. Then Barrow Hill changed the times our excursion would be on site to just over two hours. In reality this was much less, as we all had to exit the train by the front two coaches onto the tiny platform there, after a delay getting into the site. So by the time we got off the train and got back onto it before departing, we must have spent around just one and hour half hours on the site! This was compared with a round trip of nearly ten and half hours on the train. Then once inside the roundhouse, away from the incessant rain, you could see Flying Scotsman in steam, but it wasn't going anywhere. Just stuck on the turntable the whole time, unlike the next threee days where it pulled passengers along the track there. The same with Tornado outside, which was stationary the whole time we were there. The new £1.2 cafe and extension was also disappointing with no food on sale, just tea, coffee and water, with a very long queue. The shop looked like something out of Soviet era Russia with very little stock and the exhibition couldn't be found at all after following the direction arrows, so I missed seeing that. So all in all, not an enjoyable visit and trip, especially as I was on the go for fourteen and half hours. 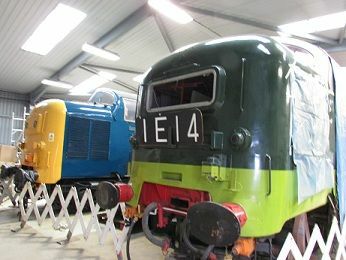 The only saving grace for me was the Deltic Preservation Society's depot next door to the roundhouse where three preserved Deltics were to be seen in all their glory. 30/9/2017 - Leigh-on-Sea to London Liverpool Street and return. London Waterloo to Surbiton. Surbiton to Hampton Court. Teddington to London Waterloo. Went over to South West London to take some photos for my book on bridges which should be out next year. Waterloo was in a bit of a mess with the same platforms closed as those in August. On my way back it was nice to see all the workers in their orange clothing sitting down by the side of the track watching the trains come into the station! 14/10/2017 - Rayleigh to Liverpool Street and return. London Marylebone to Oxford and return. Oxford to Stroud and return. Had planned this day a couple of months before, to go and see Forest Green Rovers play against Newport County in League 2 to complete visiting the 92 football league clubs once again. Unbeknown to me was that the Reading station area had been taken over for testing of the new electric trains that will replace the 125's on the London Paddington to Bristol and Cardiff routes. Consequently there were no trains out of Paddington that weekend (and on other weekends as well). It had been a very late decision on the Tuesday prior to this; only I didn't know about it! Bad marks to the Train Line for not informing me. I only found out about from a friend who was travelling to the match as well on the Friday night at 11.00pm. So I had to travel an hour earlier than I was supposed to and go to London Marylebone to catch an Oxford train and change there. Luckily I was able to get on the 5 car train before the mob and get a seat with a table. The train was "rammed" as they say with people standing in the aisles all the way to Oxford. It left Marylebone about ten minutes late and I had less then five minutes at Oxford to catch my connection. Luckily it was a 125 waiting in the sidings and was pretty empty. In fact it was going all the way to Swansea via Gloucester and Severn Tunnel Junction. Coming back was worse. It was another 125 from Swansea (possibly the same train on its return journey?) leaving Stroud at 6.00pm, half an hour later than I should have left, but giving us plenty of time to get from the ground in Nailsworth back to Stroud station. At Oxford we had a ten minute connection time, but there was a problem. They were not letting anymore passengers onto our Marylebone train as it was "full". Luckily my friend and I walked along the platform and went through an open barrier and got onto the front carriage which was nowhere near as full as coming up from London. We did have to stand all the way, but that was a better option than waiting another hour for the next one. Then at Liverpool Street the train I was getting was cancelled, so in the end I got home one and half hours later than scheduled, very tired! On a positive note, I did put in a compensation claim to Great Western and they paid my fares in full, so top marks to them. 20/10/2017 - Leigh-on-Sea to London Fenchurch Street and return. London Marylebone to Wembley Stadium. 25/10/2017 - Cranmore to Mendip Vale and return. Went down to Somerset for a few days with my wife. We went on the East Somerset Railway which was one of several birthday presents I received for my 60th - a free ride on a preserved railway line. 27/10/2017 - Leigh-on-Sea to London Fenchurch Street and return. 3/11/2017 - St Albans to York and return via Corby, Melton Mowbray, Rotherham and Moorthorpe. For my 60th birthday present I was given a trip behind Flying Scotsman going on the Yorkshireman railtour from Ealing Broadway to York, organised by The Railway Touring Company. This was definitely on my bucket list, so after reading about its problems three weeks ago, I was more than a little worried that I might be going up to York behind another steam locomotive, which is not what I would have wanted. It was touch and go whether it would be ready in time, but the good folks at the Nene Valley Railway managed to get it sorted and the trip went ahead with Flying Scotsman hauling the train. (I do feel sorry though for the people who had booked to go on the tour to Worcester the week before who were hauled by Royal Scot at the last minute and couldn't get a refund due to the terms and conditions). Anyway, the trip ran on time and there were no hold ups due to trespassers on the line, though I did see one man standing on the embankment just feet from the passing train somewhere in South Yorkshire. Also there was a stop of around twenty minutes at Alfreton for water and one passenger got left behind when he didn't get back on the train in time. Although I have been on several steam trips before, I have never seen so many people out to see a steam excursion before. Swinton station for example looked like it had more people on its platform that use it in a week! Sadly, we weren't pulled back south by Flying Scotsman, but considereing the route and distance involved the train was on time both ways. 16/11/2017 - Leigh-on-Sea to London Fenchurch Street and return. Went into London to see Alice Cooper at Wembley Arena. Chose to go on the tube both ways from Aldgate rather than getting a Chiltern Line train from Marylebone this time. 23/11/2017 - Leigh-on-Sea to West Ham and retunr. Went to the 02 to see Deep Purple. 20/11/2017 - Leigh-on-Sea to London Fenchurch Street and return. London Waterloo to Barnes Bridge and return. Went into London for a meeting. 3/12/2017 - Brockford to North Pole Halt and return. 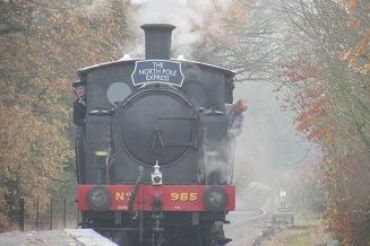 Went on the Mid-Suffollk Light Raiway with my grandchildren on a santa Special. Very well organised, friendly staff and nice presents for the grandchildren. 14/12/2017 - Leigh-on-Sea to West Ham and return. London Fenchurch Street to West Ham. 28/12/2017 - Leigh-on-Sea to West Ham and return. London Waterloo to Barnes. Barnes to Richmond. Richmond to London Waterloo. went to visit Ham House near Richmond and Marc Bolan’s monument on the way.